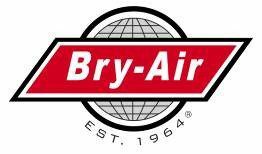 Bry-Air, Inc. desiccant dehumidifiers provide reduced energy consumption, increased safety and a cleaner environment. The control of moisture in freezers and loading docks is an operational concern in many facilities. Cold storage warehouses, product coolers and cold docks typically have large, central refrigeration systems to control the freezers and docks at their operational temperature. 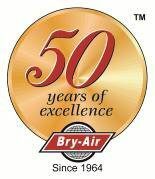 At temperatures below 50›F a refrigeration system alone is not practical for controlling moisture and condensation. This can result in wet or icy floors, frosted evaporator coils, fog, and frosted product. In active/dynamic freezers and docks the principal moisture load comes from door openings as products are moved into and out of the freezers, coolers and docks. This activity allows outside ambient air, which is typically much higher in moisture content, to infiltrate the docks and freezers. The moisture contained in the air condenses in liquid form in rooms above freezing, and in the form of ice in subfreezing rooms. This condensation occurs on any and all surfaces, causing safety hazards with slick floors and ice buildup on racks, coils and lighting fixtures. When frozen product is passed through higher humidity areas, frost can form on the outside of the pallets, obscuring bar codes and interfering with automated handling equipment. High-speed automatic doors, door seals and strip curtains reduce this infiltration, but cannot eliminate it. The number of doors and amount of traffic are critical factors in providing an accurate moisture load calculation. A Desiccant Dehumidification System provides an effective long-term solution to remove the moisture from infiltration and reduce or eliminate frost on evaporator coils. It also eliminates wet floors and ice buildup on walls, floors, refrigeration components and conveying systems. Moisture absorption of cardboard containers is also controlled, keeping them strong and stable. This makes the entire operation safer and provides a more energy-efficient installation. Removal of the moisture from the ambient air before it enters the freezer/dock is the key to preventing the condensation and ice and frost build-up on walls, floors, coils and ceilings. A desiccant dehumidification system provides a source of cool, dry air and allows the freezer/dock to operate under positive air pressure preventing the moisture from entering the space. The dehumidifier is sized based on the size and construction of the freezer and docks, the number and type of dock and freezer doors, and the expected traffic through the dock and freezer.